Like everyone else in America, I have a love/hate relationship with the cable company. It has taken us 3 weeks to get our newly acquired cable television (or a.k.a. cable-all inclusive-mega package with yearly escalating bills). What does this have to do with gardening? A lot, when your cable box is on one corner of your property and the input into your house is on the entire opposite side of everything. I found myself running outside, in bare feet, to throw myself in front of a large gasoline powered trencher. My friendly, smiling, undocumented, cable layer had decided to run our cable through the exact center of our garden. After a lot of hand waving, pointing, and throwing “O’s” at the end of words, we came to an agreement. 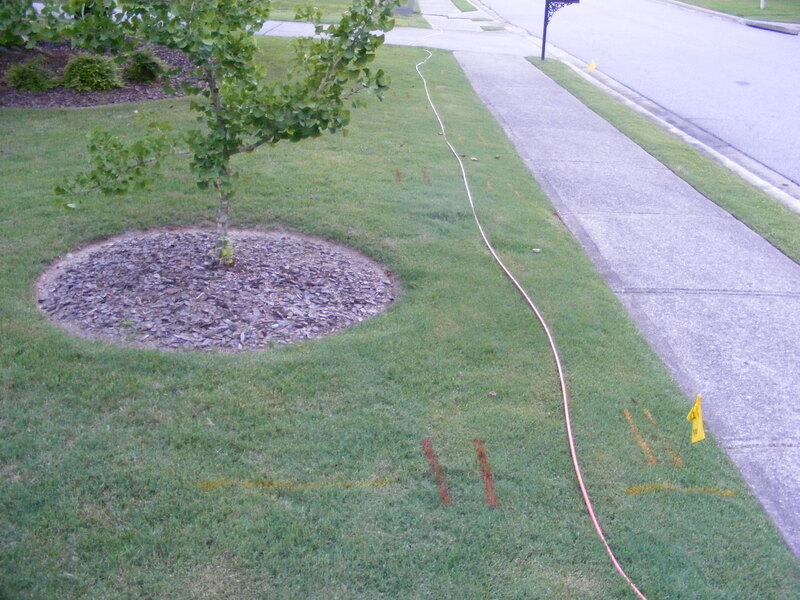 They ran the cable around the outside perimeter of the property. Cable vs. 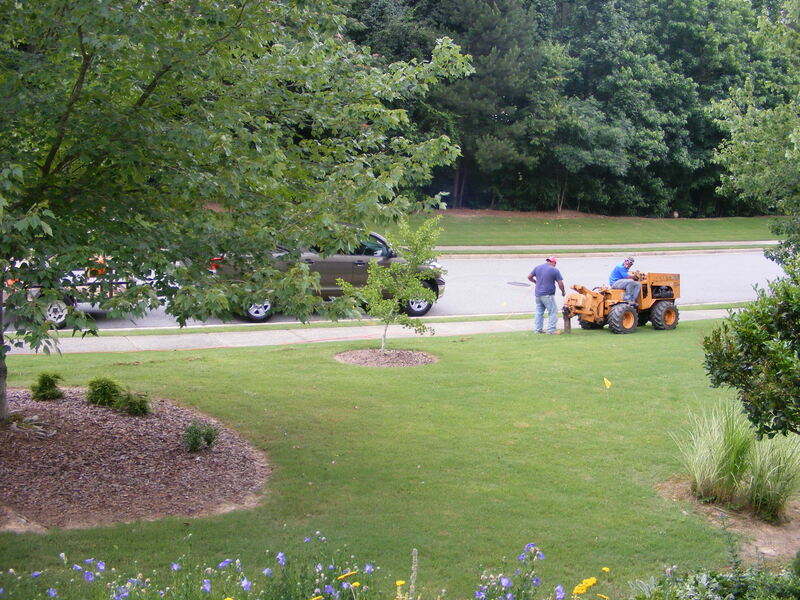 Gardening Tip #1 – “THEY” COME WITH GAS POWERED TOOLS. BE PREPARED TO THROW YOURSELF IN FRONT OF LARGE MOVING OBJECTS. 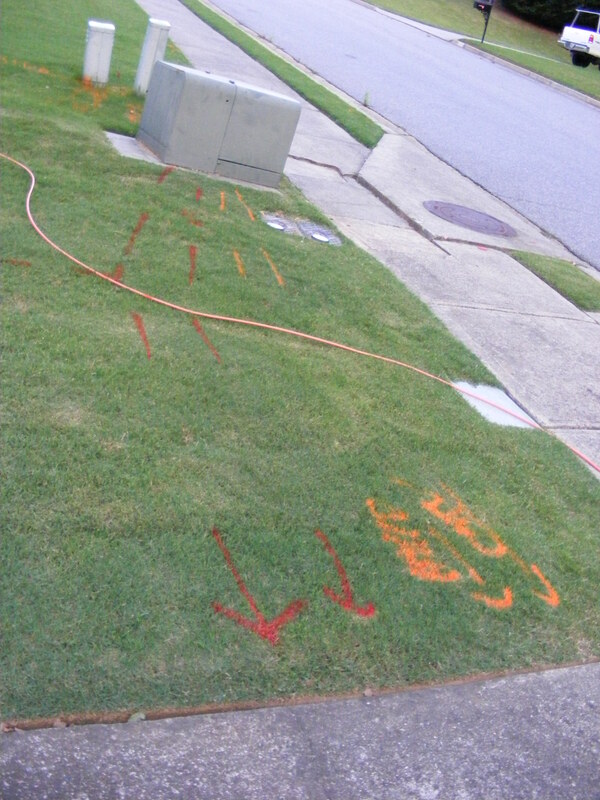 The nice advantage to me, the gardener, in having cable line buried in my yard is that they telephone a company that comes and marks all the buried power lines. For a while your yard looks like its covered in Egyptian hieroglyphics. Not very pretty, but it reminds you where it is dangerous to dig. You can really hurt yourself by hitting a power line with your shovel. It is nice that the person they sent to mark our lines was a woman. I went outside and asked questions about where power/gas/phone lines were buried. I was shocked to see where the builder had placed certain lines. Cable vs. 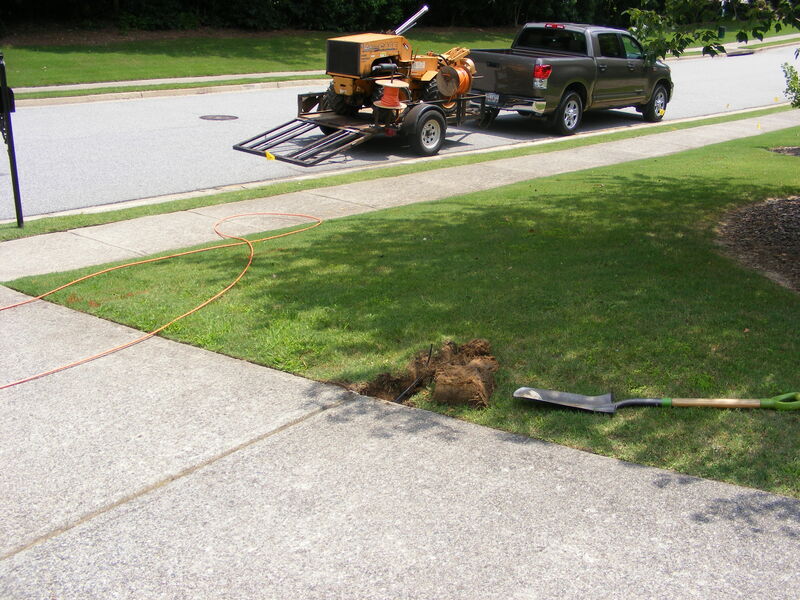 Gardening Tip #2 – YOUR POWER/GAS LINES CAN BE BURIED ANYWHERE. BUILDERS DO NOT NECESSARILY PUT THEM IN LOGICAL PLACES. I am formulating a plan of where to put large shrubs, where to put cuttings (with tiny root balls), and where to scatter seeds. Areas where I know cable is buried I can smother the grass, add a little topsoil and compost, and then scatter seeds of perennial flowers. I’m very focused on the area around the electrical box. 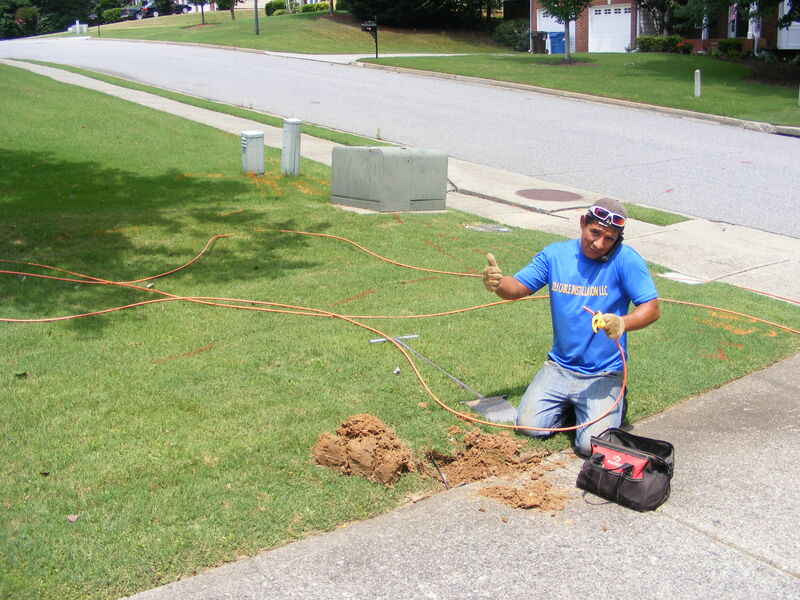 On two sides of this box, cable line snakes out underground, and one set of cable line goes in front of a tree and the other cable line goes behind the same tree. You would think when the builder put this all in, both cables could have been laid in the same direction around the tree. Cable vs. 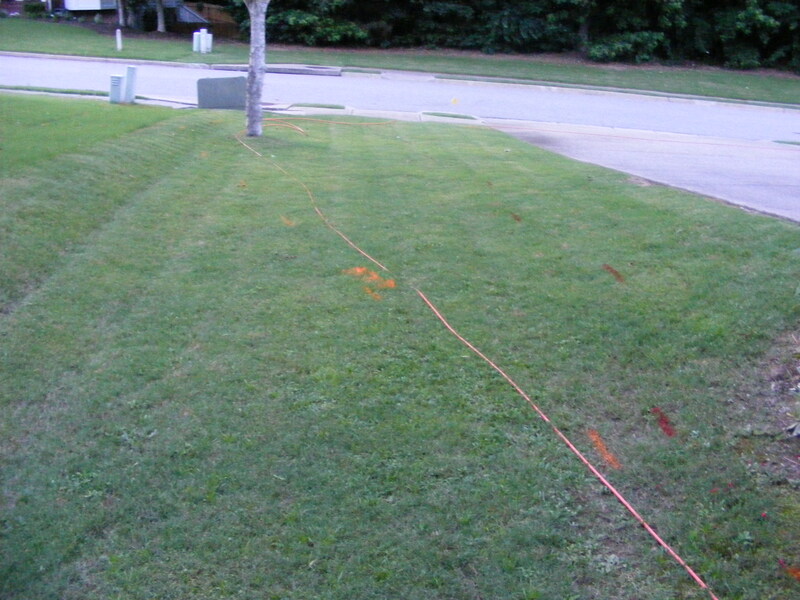 Gardening Tip #3 – AFTER THEY MARK WHERE BURIED LINES ARE, TAKE PICTURES OF YOUR GARDEN AND ALL THE MARKINGS SO YOU KNOW WHERE POWER/GAS/PHONE IS LOCATED UNDERGROUND. THIS CAN BE KEPT IN A FILE FOR FUTURE REFERENCE WHEN DIGGING. I have decided to plant a Chaste tree with beautiful blue flowers in the area where a large shrub with a large root ball could go. In front of this I will put an Iceberg rose, I have found this rose to work well in my climate. It has a wonderful, pure white flower. I have also rooted cuttings of boxwoods from my large group of them and started planting balloon flower seeds. Plans, plans, plans – I’m always drawing blueprints in my head. When I get everything planted, I will post pictures. Happy gardening and be aware of buried power lines!